Today brought temperatures into the lower 90s in parts of the immediate NYC area, but temperatures will only get warmer. Tomorrow will bring 850 mb temperatures near 20-21c, which combined with a WSW wind will allow temperatures to reach the 90s across most of the area. 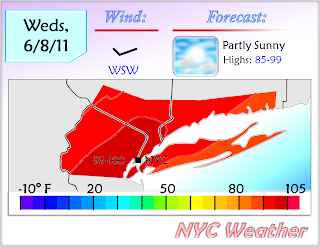 Mid to upper 90s are expected in the immediate NYC area, with Newark getting close to the 100 degree mark. The WSW wind will also allow parts of Long Island away from the southern coast to reach the lower to mid 90s, with similar temperatures expected in southern Connecticut as well. Wednesday night will remain mild, with lows only as low as the upper 70s in NYC, already warming well into the 80s by the morning hours. Thursday will bring slightly warmer temperatures, with a few places in NE NJ potentially reaching the 100 degree mark. 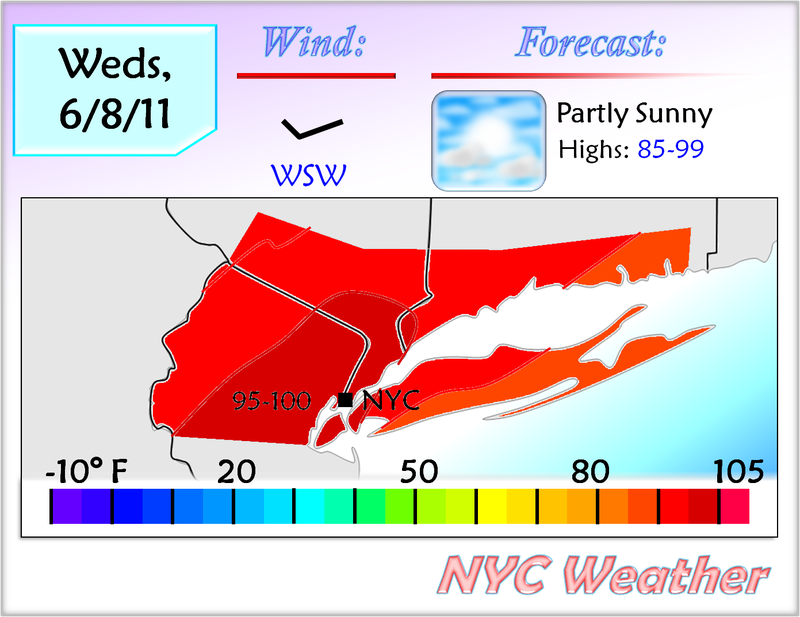 Humid conditions are expected as well, with a heat index up to 105 degrees possible. The cold front will begin to move towards the area, with scattered thunderstorms, potentially severe, expected in the early overnight hours of Thursday. These storms may be capable of producing heavy rainfall, strong winds and hail. The highest risk of severe weather, however, will stay to the north of the area, with more widespread storms expected in the Northeast. Friday will bring colder temperatures, reaching the lower to upper 80s across most of the area, with the weekend bringing more clouds, high temperatures back into the 70s, and widespread thunderstorm chances. More information on the weekend will be posted with tomorrow’s update.